The year is 1965 and the Breckenridge Ski Resort is a new phenomenon up on Peak 8. The lodge and a few lifts are less than 5 years old and not much has been developed on the ski-hill side of the valley. A few gentle runs had been cut, and extended all the way down to Main Street. A beginner hill with a rope tow is carved out across the valley in Carter Park. Next door to this park, the Falcon Condos for sale have just been completed and they are modern European ski style – concrete and glass. The hot new look in 1965. You can check out the active Falcon condominium listings directly below, or keep reading about this amazing complex. Falcon Condos were the hot new look when they were completed in 1965 - modern European ski style – and emphasize concrete and glass. They remain sleekly efficient two-story townhomes with bedrooms and a rec room on the entrance level, and an open living. Any Falcon Condo for sale will be very similar to the others. They are two story townhomes with bedrooms and a rec room on the entrance level, and an open living area on the top floor – each floor with ceiling to floor windows that face the ski resort. The floor plan is long, thin and open, with a breakfast bar separating the kitchen from the rest of the space. Only one unit has more than two bedrooms and all but one have two baths. 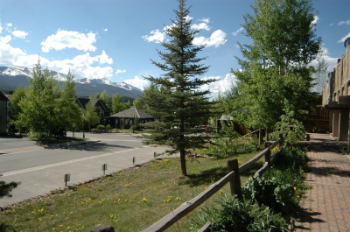 From the Falcon Condos it an easy three-block walk through the historic district to Breckenridge Main Street. From the park there are trails through public open space that lead to national forest, which are continuous for many miles and connect to county trails. It’s still possible to ski down from the mountain to Park Avenue, a block west of Main, and that’s not more than 5 blocks home to the Falcon, but more conveniently, the free town shuttle runs along French Street – winter and summer – and is an easy walk from High Street and the Falcon Condos. Size: 1089 sq. ft to 1120 sq. ft.
Driving south on Main Street turn left on any street from Wellington to Adams and travel 4 blocks east to High Street, turn right and the Falcon Condos will be on your left when you reach the end of the road and Carter Park. 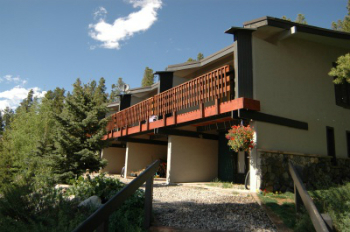 Falcon Condos 302 S. High St.
We would be happy to show you around Breckenridge and help you find the perfect real estate opportunity. Get in touch online or call us at (970) 453-2200 to find out how we can help you!